Renowned for its warm fragrance and spicy flavor, the bark of the cinnamon plant has been used for hundreds of years as both a seasoning and medicine. In modern naturopathic medicine, practitioners regard cinnamon as a natural treatment for chronic conditions such as type 2 diabetes and high cholesterol. Although there is only limited evidence to support the use of cinnamon bark supplements, these products may be a helpful addition to a healthy lifestyle. Consult a physician or dietitian before using cinnamon bark supplements, particularly if you have a medical condition. Cinnamon bark is associated with several important nutritional benefits. USDA National Nutrient Database reports that cinnamon is a source of micronutrients such as vitamin K and iron, and also a source of calcium, manganese and dietary fiber. A 1-tablespoon serving of cinnamon contains 1.4 milligrams of manganese, which is almost 75 percent of the recommended daily intake of 2 milligrams. Manganese may help prevent osteoporosis, anemia and symptoms of pre-menstrual syndrome, according to MedlinePlus.com. Cinnamon is naturally low in fat and sugar, and it can add flavor and zest to food without increasing its sugar, fat or calorie content. 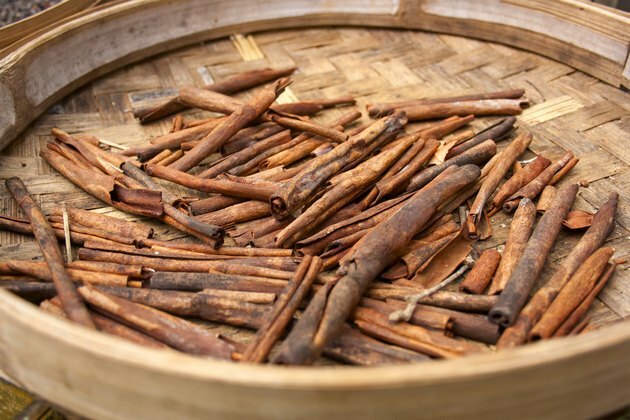 Many of cinnamon bark's nutritional and medicinal benefits relate to its potent antioxidant capacity. Antioxidants are compounds that protect living cells against the damage associated with free radicals -- highly reactive oxygen molecules produced in response to pollution, poor diet, cigarette smoke and stress. One study, published in 2009 in the "Journal of the American College of Nutrition," demonstrated that overweight people experienced less free radical damage while taking cinnamon supplements. By blocking the effects of free radicals, antioxidants such as cinnamon may help to prevent cardiovascular disease and certain forms of cancer. Cinnamon is used in naturopathy to treat type 2 diabetes, a potentially serious medical condition which can cause dangerously high levels of glucose, or sugar, in the bloodstream. In a 2003 edition of "Diabetes Care," the American Diabetes Association published the findings of a small-scale study, which determined that daily doses of 1 to 6 grams of cinnamon can help to reduce blood glucose levels. These findings were encouraging but inconclusive; more clinical trials are needed to prove cinnamon's efficacy as an alternative or complementary treatment for diabetes. The American Diabetes Association says that diabetic patients taking cinnamon experienced reductions in cholesterol and triglyceride levels, while those taking a placebo did not experience these effects. The same study in "Diabetes Care" that showed cinnamon's effects on blood sugar, showed that cinnamon use also reduced triglycerides by 30 percent, LDL or bad cholesterol by 27 percent and total cholesterol by 26 percent. The study did not show a change in HDL or good cholesterol.